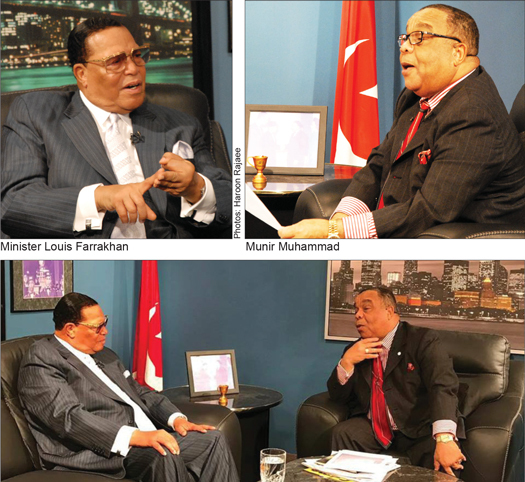 CHICAGO (FinalCall.com)—Cold temperatures and the first significant snowfall of the winter season in the “Windy City” did not quell the excitement and uplifting spirit of a recent power-packed interview by the Honorable Minister Louis Farrakhan on Muhammad and Friends, hosted by Munir Muhammad. The live in-studio broadcast took place at the headquarters of the Coalition for the Remembrance of the Honorable Elijah Muhammad (C.R.O.E.) and covered a myriad of topics critical to Muslims, Black America and the world as the end of 2016 approached. In a year that saw the election of a polarizing and controversial presidential candidate and continuation of extrajudicial killings of Blacks by law enforcement that sparked anger, demonstrations, protests and sometimes violent reactions on both sides, the Minister offered a consistent voice of reason, warning and guidance during the Dec. 11 broadcast which also included a Q and A session from callers into the show. Min. Farrakhan started the interview by thanking his longtime friend, Munir Muhammad for a forum that allowed people to become more acquainted and familiar with their teacher, the Most Honorable Elijah Muhammad. “What a man that was in our midst and what a man is in our midst,” said Min. Farrakhan speaking of the Nation of Islam patriarch. During the interview, which lasted over an hour and streamed live at croetv.org, the Minister addressed controversy stemming from comments made about him by Congressman Keith Ellison (D-Minn.), shared his insight and views on President-elect Trump and offered guidance for men and women locked in prisons and jails throughout the country. He also shared his appreciation and respect for the Five Percent Nation of Islam and followers of Noble Drew Ali from the Moorish Science Temple. Not holding back, Munir Muhammad immediately asked the Muslim leader his reaction to disparaging remarks made by Rep. Ellison as the politician pursues a bid to become chairman of the Democratic National Committee after the party suffered crushing defeats in the recent presidential and congressional elections. The previous chair, Debbie Wasserman-Schultz, also resigned under controversy. “People who want to get ahead, you say things and you do things that the enemy already knows you’re being deceitful because you can’t out deceive the master deceiver. So in order to get something that you want, you trash someone that they don’t like. Well who cares? I don’t bother with Brother Keith, I wish him success, poor fella,” said the Minister. Rep. Ellison has been pushed to the forefront by some Democrats who think his progressive views on some social issues coupled with the fact that he is Black and Muslim could make the party seem more appealing, inclusive and diverse in its leadership. He was the first Muslim elected to Congress. Rep. Ellison has attempted to distance himself from his past affiliation and work with the Nation of Islam, his previous published defenses of Min. Farrakhan and his assistance and participation in the historic 1995 Million Man March. He also distanced himself during his 2006 congressional run but the issue has come full circle as he attempts to lead the Democratic National Committee. Mr. Ellison recently wrote reckless remarks and hurled baseless accusations of “anti-Semitism” at Min. Farrakhan. The reaction by Rep. Ellison and others speaks to an element of White and Jewish control in the affairs of Black people, when it comes to economics, politics, media, the music industry and Hollywood, the Minister explained. “If he has to bash me in order to get a job, help yourself, brother. Say whatever you think will get you your DNC job. But you have not diminished me one atom’s weight. What he’s done is diminished himself,” explained Min. Farrakhan. The Nation of Islam has not done anything to harm Rep. Ellison or his aspirations, he continued. Min. Farrakhan complimented the congressman, calling him intelligent and stating that he could possibly help the Democratic Party but did not like the way he went about his repudiation. “Evidently the enemy has made me the litmus test for all Black people who want to rise in their world. Now I’m rising in their world and they cannot stop my rise in their world. So the wind that’s beneath my wings that is making me probably the most listened to Black man not only in America but in all the Black world,” said Min. Farrakhan.